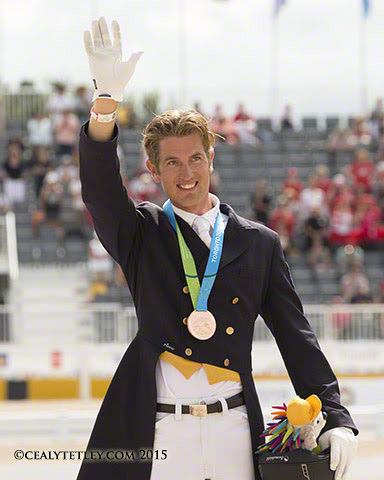 Chris von Martels of Ridgetown, ON, claimed the individual bronze medal in dressage freestyle competition held Tuesday, July 14, at the TORONTO 2015 Pan American Games. Dressage competition took place July 11, 12, and 14 at the OLG Caledon Pan Am Equestrian Park in Caledon, ON. Following a hotly contested team final that saw the United States edge Canada for the gold medal, 21 athletes returned on Tuesday to determine the individual medals. Von Martels and Zilverstar went from strength to strength, producing a fluid, energetic test set to music by U2. The five-member panel of judges rewarded the pair with a score of 79.50%, giving von Martels the individual bronze medal. Von Martels was in good company in his major games debut, as United States Equestrian Team veterans Steffen Peters and Laura Graves claimed the individual gold and silver medals. Peters, a three-time Olympian, rode Legolas 92 to the winning score of 80.075% while Graves, who made waves at last year’s Alltech FEI World Equestrian Games in France by placing fifth individually, earned a score of 79.825% for silver riding Verdades. For von Martels, earning personal best scores in all three phases in front of a home crowd was a thrill. Canada’s other two representatives, Belinda Trussell and Brittany Fraser, both received a score of 76.800%. Using the artistic marks to break the tie, Trussell was placed fourth while Fraser earned fifth. Trussell choreographed the required technical movements for the grand prix freestyle to an original composition by Arlene Bynon and Dave Grein. Her freestyle choreography featured an impressive piaffe and passage tour that started her test with Anton, a 15-year-old dark bay Sachsen-Anhaltiner gelding (Antaeus x Melit) owned by Robyn Eames and Marc Trussell, on a high note. Hailing from nearby Stouffville, ON, Trussell enjoyed being supported by a home audience, as well as her family and friends. Fraser of New Glasgow, NS, was also thrilled with her top five placing in her major games debut. She has been partnered with All In, a 10-year-old liver chestnut Dutch Warmblood gelding (Tango x Damiro) owned in partnership with Marc-Andre Beaulieu, since purchasing him at an auction in The Netherlands in 2010. In Sunday’s team final, Fraser, Lane, Trussell and von Martels earned the team silver medal for Canada. Fraser and von Martels contested the small tour level for Canada while Megan Lane and Trussell competed at grand prix, a new requirement for Olympic eligibility that was introduced at the TORONTO 2015 Pan Am Games. With only one spot available, the U.S. booked a ticket to Rio by winning the team gold. Unfortunately, the format saw only the top three riders from each nation move forward to the individual final. However, Lane, 24, of Collingwood, ON, performed her grand prix freestyle test with Caravella, a 14-year-old bay Dutch Warmblood mare (Contango x Riverman) owned by the athlete and Cathy Lane, prior to the start of grand prix freestyle competition for an appreciative crowd. At her first major games in the role of chef d’equipe, Alison Martin was thrilled with the Canadian Dressage Team’s performance, noting, “They rode exceptionally well. So many personal bests were achieved this week. They fought hard and I really feel they came out with an excellent experience. The Canadian Dressage Team was supported at the TORONTO 2015 Pan American Games by chef d’equipe Alison Martin, Team Manager Christine Peters, Special Advisor Desi Dillingham, Mental Coach Dirk Stroda, Veterinarian Dr. Geoff Vernon, and Therapist Usha Knabe. The next event on the Pan Am equestrian schedule is eventing, which takes place on July 17, 18 and 19. Dressage and show jumping portions will be held at the OLG Caledon Pan Am Equestrian Park, while cross-country will be held at the nearby Pan Am Cross-Country Centre at Will O’Wind Farm.